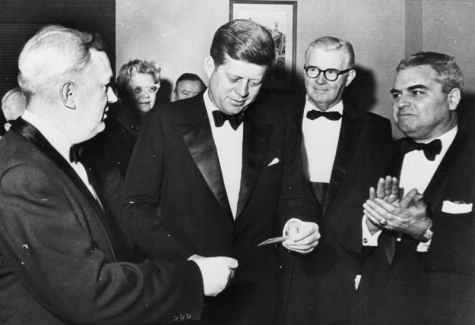 Just eight days after his own inauguration, President John F. Kennedy made a surprise visit to the National Press Club on Jan. 28, 1961, during the inaugural ceremony of NPC president John Cosgrove. In the photograph, Kennedy receives his Club membership card from Cosgrove (left). In the 1960s, a young woman stands outside the entrance to the members’ bar of the National Press Club. 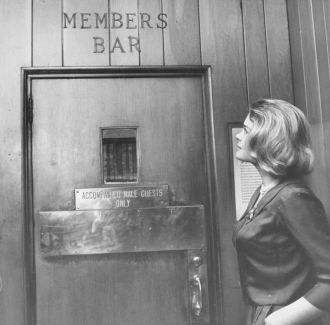 The sign on the door reads “Accompanied Male Guests Only,” a reference to the Club’s discriminatory policy at that time that barred women from membership. Only a week before he left the presidency in January 1969, Lyndon Johnson chose the National Press Club for his final news conference. Although an honorary member, Johnson stopped to sign the guest register as he left. Almost immediately, some unknown person ripped the page from the book. Was it a Vietnam War protest or just the theft of a valuable autograph? To this day, no one knows. 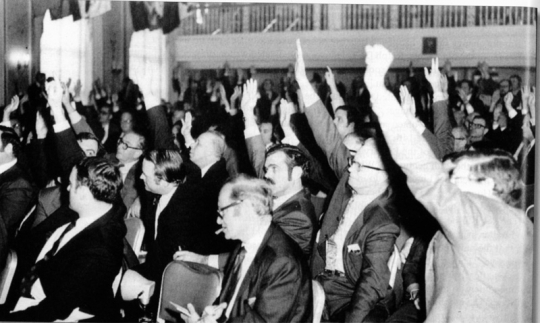 On January 15, 1971, the National Press Club voted, 227 to 56, to admit women to membership. The photograph captures the historic moment as the ‘ayes’ registered their approval. 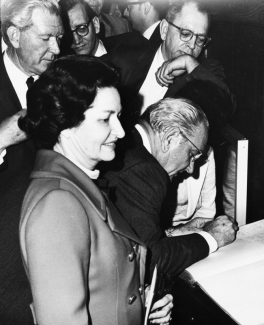 On January 15, 1971, the National Press Club voted, 227 to 56, to admit women to membership. Two months later, the first 24 female members were sworn in, including Sarah McClendon, Helen Thomas, and other prominent media figures. In this photograph, NPC president Vernon Louviere, a former opponent of inclusion, introduces them to the Club and the wider journalism community. Georgia Gov. 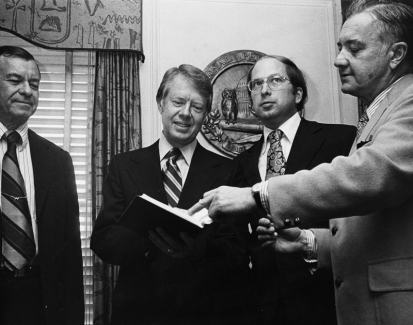 Jimmy Carter announced his presidential candidacy at a National Press Club luncheon on Dec. 12, 1974. Two years later, the previously obscure Democrat won his bid and entered the White House. Georgia Gov. 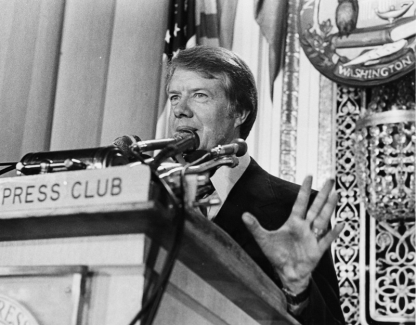 Jimmy Carter announced his presidential candidacy at a National Press Club luncheon on Dec. 12, 1974. He is shown signing the Club’s guest book after his speech. Two years later, the previously obscure Democrat won his bid and entered the White House. 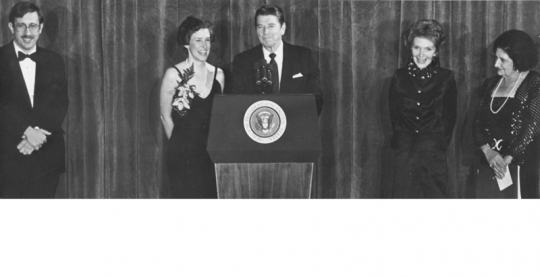 President Ronald Reagan read the oath of office himself, when in 1982 Vivian Vahlberg was sworn in as the first woman president of the National Press Club. At the time, female journalists had only been allowed as members for 11 years. Since Vahlberg’s inauguration, however, nine more women presidents have followed in her footsteps. The Women’s National Press Club (WNPC) was founded in 1919 as an alternative to the National Press Club (which barred women from membership). On Jan. 12, 1971, in a maneuver that preceded the NPC’s referendum to admit women by three days, the WNPC voted, 113 to 6, to open its doors to men and changed its name to the Washington Press Club (WPC). Rivalries intensified and by 1982, negotiations were underway to unite the two clubs. 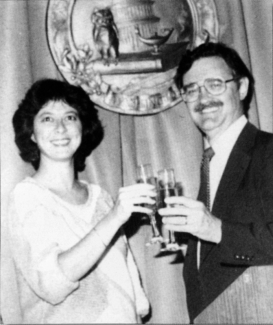 In this photograph, WPC president Susan Garland and NPC president David Hess toast the successful merger on April 29, 1985. 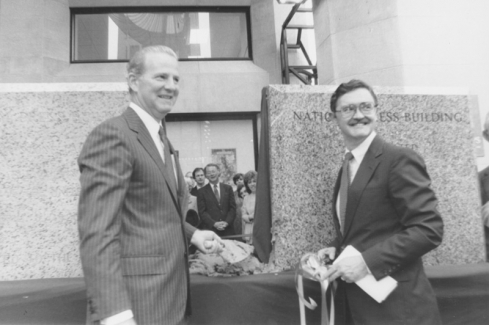 On May 25, 1985, Treasury Secretary James A. Baker III and NPC president David Hess rededicated the National Press Building after the completion of extensive renovations.